Kabak is a small village in Lycia, Turkey. It is the perfect place to escape the package tourist groups, and a great place on the Turkish Mediterranean to have a truly laid-back experience. As it doesn't have sufficient population to be designated as a "village", Kabak is officially a neighbourhood of Uzunyurt, and as such, is usually omitted from maps, even quite detailed ones. Kabak consists of two physically seperate sections: the settlement proper, a small agglomeration of two-story buildings along the road, clinging on a mountainside way above the coastline (though with a view of beautiful Mediterranean), and the cluster of guesthouses below, between the coast and the canyon known as Kabak Koyu, which, with its pine groves, waterfalls, and coastline, is quite similar to much more famous Butterfly Valley of Faralya; however physical access to Kabak Koyu is a little easier than Butterfly Valley, although the relative remoteness of Kabak offsets that. The state of development in Kabak is in major flux. There are still backpacker/family oriented places that are truly interested in keeping Kabak beautiful and are invested for the long-term (Full Moon, Reflections, Sultan, Kabak Valley Camping, Turan Hill Lounge, and a few more), but they are being pushed out of the way by developers who just want to make a buck quickly (Lonely Planet authors got free accomodation/food here in exchange for a certain place being highlighted) and have no interest in the long-term outcome of Kabak besides profit. Someone who remembered it from 2005 would find it different now. For example, to build a resort on the property closest to the beach, they cut down the forest next to the beach. They also want to pave the road to the beach so package tourists can come. 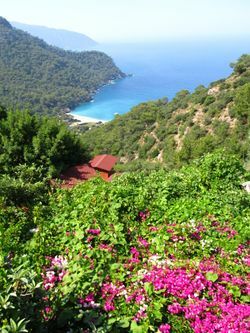 If you want to stay at a place that is helping Kabak stay beautiful, choose wisely. There are minibuses (dolmuş) from Ölüdeniz. They are relatively frequent, (every 1-2 hours until 19:00 or so). They return to Ölüdeniz and continue to Fethiye at the same frequency. 4 TL for a trip from Ölüdeniz, 7 TL from Fethiye further away. A heavily winding road connects Kabak with Ölüdeniz, passing through Faralya on the way. Road condition is good until the upper village of Kabak. Decending into the valley, it's a rough dirt road. Total distance from Ölüdeniz is around 25 km. Lycian Way, a waymarked hiking trail passes through the village, providing a tiresome but peaceful connection with Ovacık, a suburb of Ölüdeniz. It takes a de-tour through the mountains, with many impressive vistas and through hamlets no one—except hikers—has ever been, and gradually loses height for Faralya, once more to go up to mountains and descending this time to Kabak. Most hikers break this 22-km section into two days, with an overnight stay in one of Faralya's guesthouses. You can follow the Lycian Way, indicated by red and white painted stones that lead all the way down to the beach, about 20 minutes downhill on a dirt path, and beyond. It will pass by many places to stay, most with restaurants if you want to eat. Another branch of the Lycian Way passes around the upper part of the valley. There is a dirt road (branching from the main road from Faralya about 2 km away from the village) leading into the canyon and the coast, however if you have any smallest bit of love for your car, avoid driving through that road (think of a rocky downslope where the soft topsoil has all but bulldozed). Instead, you may park your car in the upper village and take a dolmuş down there—they don't have fixed hours (i.e., ready to go as soon as you pay; but you may have to wait for one returning from the coast first) and, regardless of the number of passengers, do have the fixed price of 50 TL, which, if lucky, you may share with fellow travellers waiting for one when you get there. Ask at the grocery store at the upper village for these dolmuşes. You can see the canyon itself and a number waterfalls along the canyon's sides (you have to hike a bit out of the village), swim in the Mediterranean, and perhaps take a cheesy yoga course offered by many of the guesthouses on the coast. If you are fit and keen on some tough physical exercise, maybe hike to the next settlement on either direction along Lycian Way. Other than that, you will not have much else to see or do in Kabak. But doing nothing is exactly what Kabak has to offer (and weren't you in Kabak for that in the first place?). To hike to some great waterfalls, first follow the red and white stones all the way to the beach. From the left side of the beach (looking toward the sea), continue following the red and white stones 20-25 minutes. You will see a big sign (put up by the Full Moon owner, Mustafa) that shows the Lycian Way to the right and waterfalls to the left. You will be able to follow the pipeline and old river until the waterfall. There are six or seven pools successively higher. From the waterfall, you can either return the way you came, or you can follow the red painted stones until that path rejoins the Lycian Way with red and white stones. When it rejoins, going left will return you to Kabak around the back side of the valley, and going right will return you to where the Lycian Way hits Kabak beach. There is a small grocery store in the upper village. As you might rightly be expecting, they don't accept credit cards. There is no ATM in the village either, so bring enough cash. The nearest ATMs are in Ölüdeniz (and a little futher away in Fethiye). You'll have your meals in your guesthouse. In general, you can stop at just about any guesthouse/campground/bungalow area, have a look at their food menu, and decide if you want to eat there. Since many only provide breakfast and dinner, all of them offer food to buy for lunch. If you are not staying overnight, you can easily negotiate a price for dinner. Both the upper village and the coastal part have a number of guesthouses, some of which consist of wooden bungalows. Most also offer campgrounds in their yards, because it is not allowed to camp wild at the beach or in the forest. Overall, Full Moon is the closest to the dolmus stop, but far from the beach. The rest are closer to the beach, but it's a walk back up to the dolmus stand. Something to consider if you have a heavy pack and you either want to chill in your camping/bungalow area or hang out more on the beach. Follow the red and white painted rocks for the trail all the way to the beach, through which you will pass several locations with bungalows and camping spaces. There are plenty more to find, so contribute if you stay at any of them! The more local, backpacker, and family oriented places are Full Moon, Reflections, Sultan, and Kabak Valley Camp. See the 'Understand' section more info about the tourism development in the Kabak Valley. The area code for landline phones in the village is (+90) 252. Kabak is within the coverage area of Turkey's mobile phone operators. You're out of luck if you are looking for internet cafes. The only internet available will be at the place you are staying or maybe a cafe you get a drink or food at. As far as anything running on wheels is concerned, Kabak is literally the dead end street, as the road coming from Ölüdeniz ends here, giving way to complete wilderness of Yediburunlar (literally "seven headlands") area, the remotest section of Lycian coast. However, for hikers, the fun has just started yet—the remote mountain hamlets of this rugged (and seemingly inaccessible) area is connected to each other by Lycian Way, which turns and twists on the sides of the mountains, following the coastline from a distance. Within about three days' time, after some (usually quite sharp) descents and ascents, and enjoying vistas which were practically the same thousands of years ago, you will be back to "civilization" on the Patara beach, just south of the modern town of Kınık, or Xanthos, as it was known to ancient Lycians, on the other side of Yediburunlar. This page was last edited on 27 September 2015, at 18:30.